Originally constructed in 1905, the seven-storey building boasts obtruding bay windows and hexagonal corners with arched fenestration at the mezzanine level. 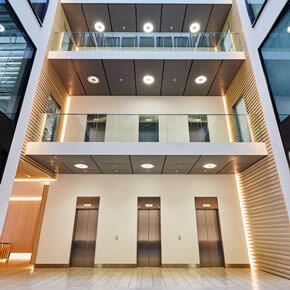 The original façade has been retained in its latest refurbishment, whilst the concrete structure around the central atrium has been demolished to create a substantial foyer, in which its five upper office floors are centred around. The ground floor now features a basement area and Reception and Retail units. 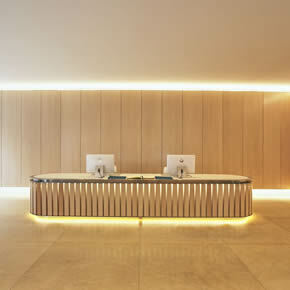 Contracted to fit out the building by Tolent Construction, Ahmarra implemented a complete refurbishment of the reception area: a bespoke timber and metal desk was installed, as well as wall panelling and a number of oak ceiling battens, which were also fitted to the walls of the atrium over 6 levels. As the project’s lead joinery and finishing sub-contracted, Ahmarra was also responsible for fitting cubicles, cabinets and vanity units in the establishment’s toilets. 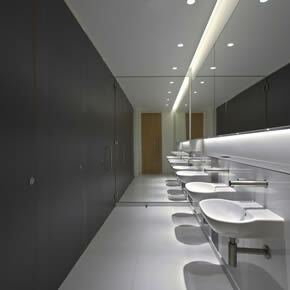 It also provided ironmongery, window boards, skirtings and timber fire rated doorsets throughout the development. The company worked closely with the project’s architect and site team in the development of the design, procurement and installation.